DUBLIN,, Oct. 26, 2017 /PRNewswire/ -- CoolSculpting hosted actress Debra Messing, CoolSculpting executives and a renowned New York City dermatologist, Dr. Ellen Marmur, to Break the Ice about the fat freezing treatment during a panel discussion on Tuesday, October 24, at New York City's trendiest ice bar, Minus5. CoolSculpting is an FDA-cleared non-surgical, clinically proven treatment that selectively eliminates unwanted fat using a patented cooling technology, owned by Allergan plc. Allergan and CoolSculpting hosted Break The Ice panel discussion on Tuesday, October 24 with Brad Hauser, Vice President of Research & Development and General Manager for CoolSculpting, actress Debra Messing, Dr. Ellen Marmur, and Mike Jafar, Vice President, Medical Aesthetics Body Contouring for CoolSculpting, discussing CoolSculpting’s science, treatment experience and results. Debra Messing, global brand ambassador for CoolSculpting by Allergan, at Break The Ice panel discussion on Tuesday, October 24 at NYC’s Minus5 ice bar. Each of CoolSculpting's Break the Ice panel speakers shared their own experience with CoolSculpting, the body contouring treatment beloved by celebrities and consumers alike. Mike Jafar, Vice President, Medical Aesthetics Body Contouring, CoolSculpting moderated the discussion. 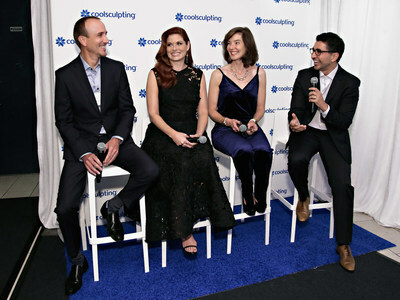 "I am proud of my body and I work hard to maintain a healthy diet and an active lifestyle, but let's face it – everyone has those stubborn areas that resist all of your hard work," explained actress Debra Messing, the Global Brand Ambassador for CoolSculpting, during the panel discussion. "For me, CoolSculpting has worked extremely well. I tell people it's my best discovery of the year. The treatment is non-surgical and has little to no downtime, which works for my busy lifestyle." Brad Hauser, Vice President, R&D and General Manager for CoolSculpting, explained how the concept or mechanism of action first originated. "It was two forward-thinking scientists at Harvard University, Drs. Dieter Manstein and R. Rox Anderson, that began investigating cold-induced injury to fat cells after reading an early case report of popsicle panniculitis in the New England Journal of Medicine. It was observed that a child developed inflammation in the subcutaneous fat and a resulting dimple after having a popsicle rest on the inside of her cheek," Hauser explained. "It was Drs. Manstein and Anderson's research that led to Cryolipolysis®, the now proven science behind over 5 million CoolSculpting treatments, where cold targets and kills fat cells without damaging the skin or surrounding tissue." "Patients typically see a 20 – 25 percent reduction of fat cells in the treated area," said Dr. Ellen Marmur, renowned New York City dermatologist, who shared some of the trends she's seen with patients. "CoolSculpting is a great option given its short treatment time of 35 minutes, FDA-clearance on multiple body parts and the ability to treat multiple areas at once to maximize my patients' time in the office. Both female and male patients are interested in CoolSculpting and the aesthetics field in general is experiencing an increase in men seeking treatments, especially non-invasive fat reduction like CoolSculpting." CoolSculpting is clinically proven to be a safe and effective way to reduce unwanted fat. Results may be seen as early as three weeks, with the most dramatic results observed 1-3 months after treatment. With a patented built-in safety feature, CoolSculpting is the only cold-based, non-surgical body contouring treatment cleared by the Food and Drug Administration. More than five million CoolSculpting treatments have been performed in more than 80 countries worldwide. More photos from CoolSculpting's Break the Ice event are available here. For more information about CoolSculpting, please visit www.coolsculpting.com. CoolSculpting is a non-surgical, clinically proven treatment that selectively reduces unwanted fat using a patented cooling technology. Cleared by the FDA, CoolSculpting works by gently cooling targeted fat cells in the body to induce a natural, controlled elimination of fat cells without affecting surrounding tissue, and the treated fat cells are gone for good. Millions of CoolSculpting treatments have been performed in more than 80 countries. CoolSculpting is available through an elite network of CoolSculpting Centers worldwide. Dermatologists, plastic surgeons and leading aesthetic specialists that offer CoolSculpting can be found at www.coolsculpting.com. In the U.S., the CoolSculpting procedure is FDA-cleared for the treatment of visible fat bulges in the submental area, thigh, abdomen and flank, along with bra fat, back fat, underneath the buttocks (also known as banana roll), and upper arm. Allergan is an industry leader in Open Science, a model of research and development, which defines our approach to identifying and developing game-changing ideas and innovation for better patient care. With this approach, Allergan has built one of the broadest development pipelines in the pharmaceutical industry with 65+ mid-to-late stage pipeline programs currently in development. Statements contained in this press release that refer to future events or other non-historical facts are forward-looking statements that reflect Allergan's current perspective on existing trends and information as of the date of this release. Actual results may differ materially from Allergan's current expectations depending upon a number of factors affecting Allergan's business. These factors include, among others, the difficulty of predicting the timing or outcome of FDA approvals or actions, if any; the impact of competitive products and pricing; market acceptance of and continued demand for Allergan's products; difficulties or delays in manufacturing; and other risks and uncertainties detailed in Allergan's periodic public filings with the Securities and Exchange Commission, including but not limited to Allergan's Annual Report on Form 10-K for the year ended December 31, 2016 and Allergan's Quarterly Report on Form 10-Q for the period ended June 30, 2017. Except as expressly required by law, Allergan disclaims any intent or obligation to update these forward-looking statements.